Stay in one of Champion's Gates newest homes! This expansive 3,909 sq. ft home can also sleep 16 comfortably with all of the amenities of a luxury resort. With 8 bedrooms and 5 bathrooms, this is a perfect home for a large family or group vacation. The professionally decorated home adheres to the finest standards and is sure to make your vacation truly relaxing. Your family will love the extra sun provided by the west facing pool deck, and you will be able to relax anytime on your private lanai. Downstairs you will find two Master Suites featuring King beds perfect for the adults who want some extra privacy. The bedrooms have plenty of space and personal TVs in both rooms. The Master Suites both feature large en-suite bathrooms with walk in showers and large counter space. Upstairs you will find the additional 6 bedrooms, 3 of which are King beds, 2 fun kids rooms, and one room with 2 full beds. The kids in your family will love the 2 bedrooms. The kid's room will sweep the kids off to a dreamed room with wall decor, with a bunk bed that offers a twin bed over a full. The kid's room shares a Jack n Jill style bathroom with bedroom 6. The second kid's room is sure to make the kids feel truly magical with wall decals and twin/full bunk beds. The kid's room shares a Jack and Jill bathroom with bedroom 8. The family will all enjoy the open floor plan throughout the living area. The dining table offers formal seating for 10 while the breakfast bar offers additional seating. The kitchen is upgraded with stainless steel appliances and granite countertops to help to make cooking in style a breeze. In the living room, you will find ample seating for everyone around the large flat screen TV. 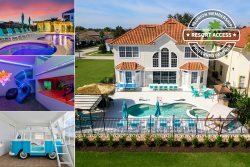 Not only does this home have 8 amazing bedrooms, but your family will also love the private upstairs theater, upstairs loft area featuring a shuffleboard, and fully equipped ground floor games room! Lounge and relax watching your favorite movie on the 120-inch projection screen with stadium seating for 7 or play a game or two on the PlaySation 4. Head downstairs for some more fun in the games room with an air hockey table, pool table, or foosball table. Play a friendly competition with the Xbox 360 or PlayStation 4 in the 47-inch SMART TVs. You will also be able to choose from a variety of arcade games. This property does not include a BBQ, however we do have them available for rental. Accidental Damage Protection plus tax will be required on behalf of the property owner against any reported damages or loss to this property and its contents. Great property, Great Experience, Overall ease of use of the property during our stay. Our time at the property was excellent filled with laughter and lots of down time to relax! The house was great and the associates at Reunion Vacation Homes were very courteous and informative. Overall great experience. Jennifer Jasonis was excellent from the beginning with helping me select a home that accommodated all of the adults and children. She helped with some of the adults making their payments; she answered question throughout the process until the date arrived. Thanks Jennifer! The home was excellent, the Clubhouse was excellent had the right amount of amenities for the entire family from the oldest to youngest. We will be back next year!